Today you’ll meet the first new addition to our corral of existing mounts—and it might be a familiar friend to many of you. Say hello to the roller beetle! From the beginning, the roller beetle was always in the back of our minds as a potential mount. 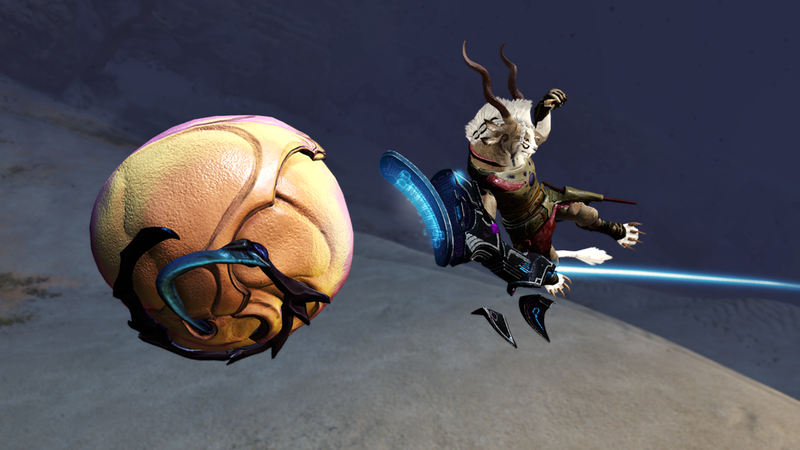 When we explored the initial five mounts and what they would be, the roller beetle didn’t really mesh with what we wanted to tackle when creating the movement skills. For context, we usually start with the idea of a mechanic, or the type of environment a mount would be suited for, and then find a creature that makes a good fit. 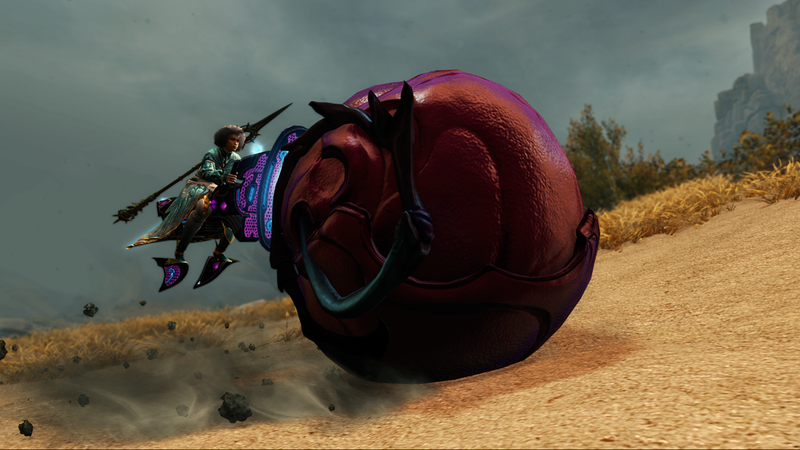 Roller beetles were a fan-favorite creature from the original Guild Wars®—and a favorite within ArenaNet—so we kept them at the top of the list for future mounts and definitely wanted to introduce them at some point. Once we started to work on the roller beetle, there was a lot of internal excitement about how we could bring them into Guild Wars 2 using the mount system. It brought some interesting challenges, though—and one of the first was determining how the player actually sits on the roller beetle. On other mounts, the saddle’s location is very straightforward and logical. In the roller beetle’s case, its entire body essentially turns into a spinning wheel. We explored a bunch of ideas—even treating it like a unicycle—but ultimately settled on a kind of sportbike saddle. 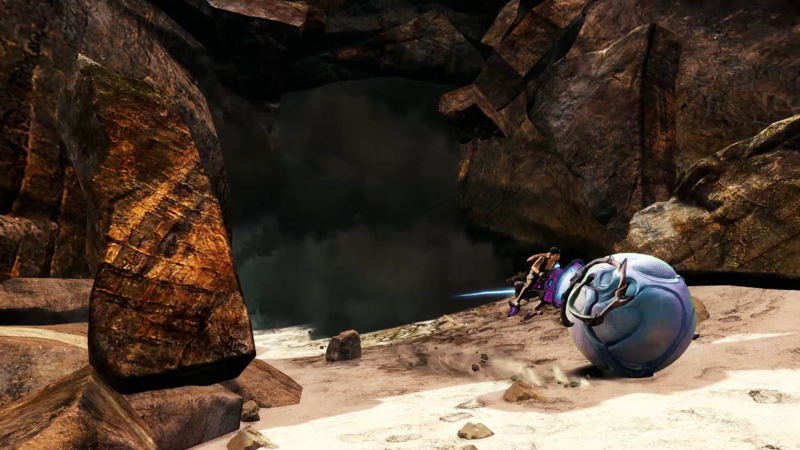 We leveraged awesome asuran technology so that the saddle is floating behind the roller beetle using the beetle as a wheel. This allowed the riding experience to mesh really well with our planned movement mechanic. Speaking of movement, let’s discuss how the roller beetle moves—and some of its crazy uses. Its ability to spin very rapidly—along with some assistance from the saddle—boosts it forward at incredible speeds. It picks up speed very quickly, reaching ground speeds close to that of a flying griffon. Obviously, with that kind of momentum from the boost, it wouldn’t make sense to have a normal range of control over its movements. Use the boost and then hang on for the ride as you rocket forward! At high speeds you can actually use the terrain as a ramp to launch yourself into the air. This was just the first iteration, and we expanded upon that as we kept developing it. After playtesting it for a while, we felt like there needed to be a way to trade off some of that forward momentum for more control…in a bit of a different way. That led us to the second big part of roller beetle riding: the ability to drift. Much like the griffon, the roller beetle has two movement skills. The first one is the speed boost, and the second is drifting. You can drift while boosted to high speeds, breaking traction from the ground. This allows you to perform more precise turns that normally wouldn’t be possible under the effects of the boost, but at the cost of speed. After this, we were mostly happy with the roller beetle—but it was still missing something. We felt like it needed a bit more interaction with the new map, so we added specially marked blockades. Your roller beetle can break these apart if you boost into the blockades, gaining access to the stashes hidden behind them. The engage skill for the roller beetle has an interesting story behind it. We messed around with ideas during our initial prototyping—and, of course, we had to do something funny with it—so we set up some choya as bowling pins and rolled into them like a bowling ball. That spawned the roller beetle’s engage skill. Roll Out rolls you right over your enemies, knocking them over on impact. We came up with another feature when we were having fun with prototyping, because we felt there needed to be a little flair when launching off the terrain into the air. The idea of giving the player character the ability to do tricks came up, and we quickly latched onto it. At first, we just had the rider perform cool, stylish tricks in the air, purely for fun. It was well received internally, so we knew the idea had promise, and we expanded on it to give it some mechanical benefits. Roller beetle tricks are performed by holding the spacebar while you’re in the air. By doing tricks, you can regain endurance for more boosts. On a more personal note, this is my last big project here at ArenaNet. I have had an amazing time at the studio working on a ton of awesome projects like this one, with so many talented people. I’ll always cherish my time here, but it’s time to say farewell as a developer here and to move back to being a player like you all. I can’t wait for you all to check out the roller beetle and to see all the awesome stuff in the works. We hope to see you all rolling around with your new friends, and we’re looking forward to seeing all the awesome spots you find while exploring maps with the roller beetle.